The first record of a Burmese cat was found in 1930 when a sailor brought a cat from the Orient and gave her to Dr Joseph G. Thompson in San Francisco. This cat’s name was Wong Mau and the Burmese cat breed was developed from her. Wong Mau was walnut brown with darker brown points. Some breeders thought she was a dark Siamese but Dr Thompson established a breeding program to reproduce her distinguishing features. In 1932, she was bred to Tai Mau, a Seal Point Siamese. This mating resulted in kittens with two colors – some like Wong Mau and the other like Siamese. Wong Mau was bred to one of her sons and the breeding resulted in kittens with 3 distinct colors – some like Siamese, some like Wong Mau and some dark brown. It was the dark brown offspring that founded the Burmese breed as we know it today. The first blue Burmese kitten was born in England in March 1955. Most Burmese breeders preferred to breed only the sable cats, although other color variations had made an appearance earlier. The Burmese was one of the original breeds to be recognized by TICA in June 1979. The European Burmese was originally the same as the American Burmese and all Burmese cats trace their history back to Wong Mau. In 1952 the breed was officially recognized in the UK in the original brown color. From there, the Burmese cat breed diverged into two completely different looks - one in the USA and one in Europe. 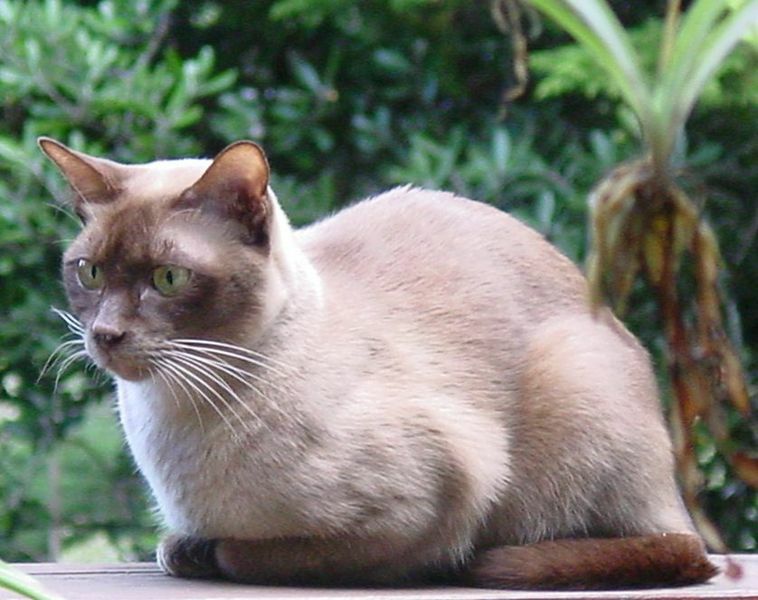 The European cats had more colors and eventually the differences in the head shape as well as the health issues led to the American Burmese being banned from European breeding programs. The Burmese cat breed is a medium sized cat with a strong, well muscled and compact body. The coat is short, silky and shiny and does not require much grooming other than a weekly brushing to remove loose hair. The head is round with large golden eyes. 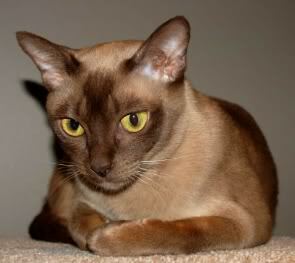 In young Burmese cats, the points will be darker and as the cat matures, the color will become deeper and richer. In older cats there is little difference in color between the body and the legs, head and tail. A range of tortoiseshell and solid colors are available – dark sable brown, a medium warm blue, a lilac that can be bright pink-gray to silver-platinum, a warm honey beige chocolate with fawn tints, reds with a tint of golden apricot and deep creams with a tint of golden apricot. 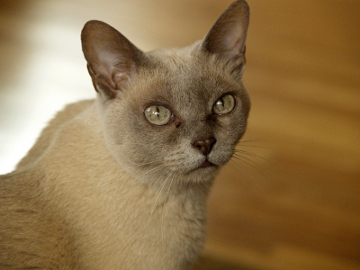 The Burmese cat breed is a people-orientated cat that loves to curl up on a lap. They are very social and playful cats and are very tolerant of children and other pets. If you are going to be leaving your Burmese alone for long periods, you have to get a companion as the Burmese does not do well on its own. This cat has a soft, sweet voice and likes to engage people in a conversation. The Burmese cat is generally sound in health but the American Burmese carry a lethal gene called the Burmese head fault or craniofacial defect. Kittens born with this defect have one lower jaw but two upper muzzles and noses. The eyes and ears are also deformed and the top of the head is incomplete. Survival is impossible and kittens often die at birth or are euthanized immediately. A cat by the name of Good Fortune Fortunatus appeared in the pedigrees of many American Burmese but he carried the lethal genetic deformity leading to the American bloodlines often being banned to try and avoid this lethal gene. Geneticists have identified the chromosome that is responsible for the deformity and hope that they will soon be able to find the gene and develop genetic testing so that the deadly fault can be bred out. 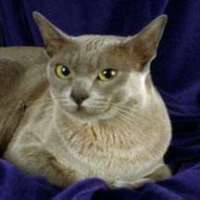 Do you have a story about your Burmese cat that you would like other cat lovers to hear about?